Spend Matters welcomes this guest post from IHS. 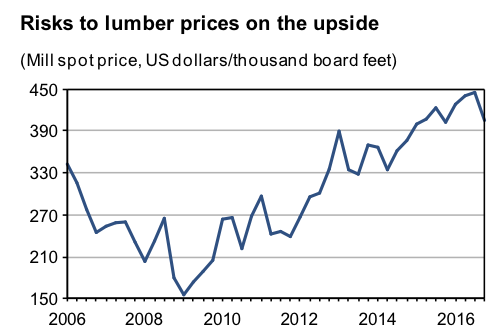 Spot lumber prices, as reported by Random Lengths (an industry publication), have been on the rise, but slowly and unsteadily. Softer than expected demand from housing and elevated inventories to date have helped alleviate some of the upward pressure on prices. Spot mill prices for spruce-pine-fir (S-P-F) 2x4 #2&Btr bottomed out in June at $310 per thousand board feet (mbf), but have since recovered. A shortage of railcars earlier in the year combined with sluggish lumber demand last spring lifted inventories to levels last seen back in early 2008. This inventory cushion is one reason prices have struggled to breach $370/mbf. However, now that transportation bottlenecks appear to be easing and lumber demand is strengthening, prices should move higher, in fits and starts, over the next few months. As of the end of October, spot mill prices stood at $340/mbf. Optimism that demand from new home construction will move higher has certainly played a role in fueling the gains. After a slow start to the year, new home construction picked up over the summer, with single-family housing starts rising 4.9% year over year to an annual rate of 625,000 units in the second quarter. Residential construction will likely see additional gains in the coming months, fueled by healthier household balance sheets, improving demand for housing and homebuilder optimism. By the fourth quarter, single-family housing starts will be running at a seasonally adjusted annual rate of 673,000 units. Barring a sudden slowdown in new home construction, lumber prices will likely to continue rising through the end of the year as inventories are gradually worked off. After bottoming out at $335/mbf in the second quarter, spot mill prices are forecast to average $376/mbf in the fourth quarter. Assuming the average national delivered premium remains near $95/mbf, this spot mill forecast should translate into a delivered national average price of $471/mbf in the fourth quarter. US lumber production has closely tracked developments in demand since the start of the year, exhibiting little growth in the winter and spring as housing markets struggled to find their footing and then expanding rapidly in the summer as housing starts improved. By July, softwood lumber production in the US West was up 10% y/y. Although production growth has since slowed, third quarter production was still 2% higher than year ago levels. In a similar showing of strength, production in the US South (through July) is 9.4% higher than year-earlier levels. In contrast, Canadian production continues to rise at a steady but slower rate. Combined June and July Canadian softwood lumber production was up 3.9% y/y. Access to stumpage may be a lingering influence holding back Canadian production. Fortunately, this has yet to negatively influence the country’s lumber inventories, which were up a healthy 10.1% y/y in July. However, the situation bears watching. If Canadian production fails to keep up with improvements in demand, the US West and South will have to make up the difference, which could temporarily jolt prices higher.